It’s that time again…the garland is hung and the ornaments are all in place. We have put together a unique collection of wonderful one-of-a kind treasures… pottery, glass, wood, jewelry, wall and fiber art. Beautiful handcrafted gifts for everyone on your list! Glass artist Brett Tam will give a demonstration on the gallery’s front porch during the opening. COME EARLY FOR OUR SHOW PREVIEW This FRIDAY MORNING, November 1st, from 10:00-12:00. Refreshments will be served and you will be eligible to win a lovely gift basket loaded with gallery goodies! You will also get a “first look” at this exciting collection of art gifts, and a jump-start on your holiday shopping! March has been very busy at the gallery. We started with the opening for What a Difference a Day Makes: 24 Hour Art Challenge; bringing together 24 artists from our community to support Very Special Arts Brevard. On March 15th we had the premiere for the wonderful documentary produced about the project, and a fabulous gala reception and “art-raffle”. The artwork produced for the project is hanging in the front gallery this week only… Some of the wonderful work is still available for sale. Proceeds go to Very Special Arts Brevard. You can watch the video online. Whew! 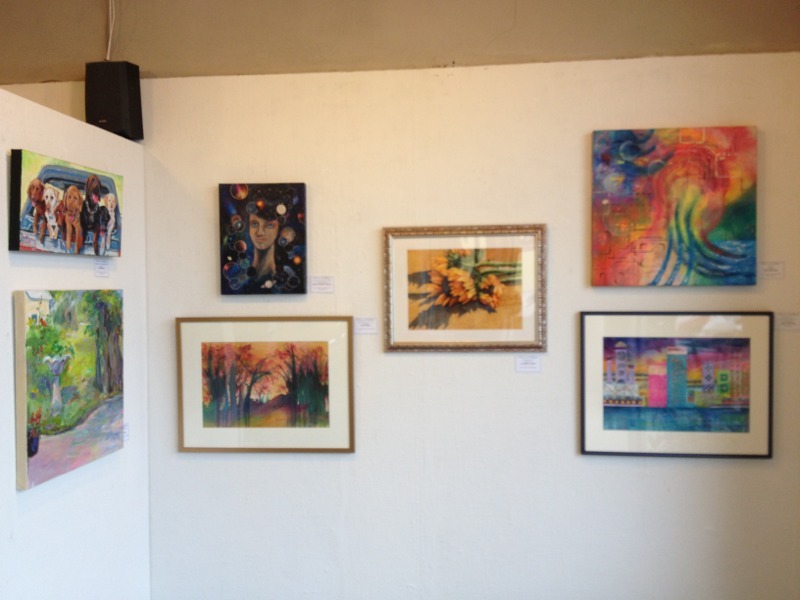 What an exciting March it has been at the gallery! Months and months of planning and coordinating… 24 artists, 24 hours, 24 works of art to raise money and awareness for Very Special Arts Brevard. We are so fortunate to have partnered with Brandt Ronat & Company to capture the artists and their approach to the challenge in an amazing documentary about the project! We had a wonderful premiere and gala reception on Friday, March 15th and thus far have raised over $4,000 for VSA Brevard. Thanks to all who participated… the artists, the filmmakers, the merchants who donated items for our raffle baskets and our wonderful patrons who bought tickets! The documentary really pulled the project together. The 24 artists worked separately…in their own studios and homes and did not, for the most part, have much interaction until after the challenge was over. We talked to them about art and it’s effect on their lives and all the connections are captured on film. Last Friday and Saturday the 24 participating artists took the challenge! They received an email early morning of their workday with a list of prompts… words and phrases like: “echo of a dream, fresh, song in action… They chose three from the list of seven and started to work on their art piece. They had 24 hours to create a work of art. The 24 pieces of newly created art will hang at the gallery during the month of March. What a Difference a Day Makes: 24 Hour Art Challenge will benefit Very Special Arts Brevard their website through sales of the work. The artwork will be sold via a “guaranteed raffle”. All Big Ticket holders will choose an artwork from the exhibit. To add to all the excitement of the challenge, we enlisted Brandt Ronat and Company to document the artists efforts on video. Each artist was visited during their workday and caught on film; the footage will be used toproduce a documentary about the project. The exhibit will open for the general public on Friday March 1, 2013. The film premiere and gala reception will be held on Friday March 15, 2013. Tickets are available at the gallery and online. Are you coming to the film premiere and gala reception on Friday March 15th? Better get a ticket. You can check out the lists of artists and buy your tickets here . Our Bi-Annual fundraiser; What a Difference a Day Makes; 24-hour Art Challenge will be held in March 2013. The 24 participating artists will have a 24-hour period in which to create an artwork based around a small set of prompts and guidelines to be revealed that day. These works will be sold via a “guaranteed raffle”to raise money for Very Special Arts Brevard; Established in 1987, this local organization is committed to providing persons with disabilities the opportunity to reach their full potential through the arts. Thanks to the creative talents at Brandt Ronat & Company we will be videotaping a portion of each participant’s work day and producing a documentary about the project that will be screened prior to our special reception. For a list of the participating artists and how to get your ticket see more here. As part of our continuing Second Saturdays at the Gallery , Lori Pitten Jenkins will be demonstrating her watercolor techniques from start to finish. She will also be speaking about the thought process of her unusual subjects and whimsical titles. Lori has a clear, brilliant, colorful style of watercolor painting that is unique to her. She will be raffling away 2 original watercolors at the end of the demonstration. Free and open to the public, seating is limited so arrive early for a good seat! While you’re at the gallery, enjoy Lori’s solo-exhibition Something Fishy. Lori is a Brevard County native and grew up around the water. She recently won the Best of Show in Watercolor at the Melbourne Art Festival, 2012. 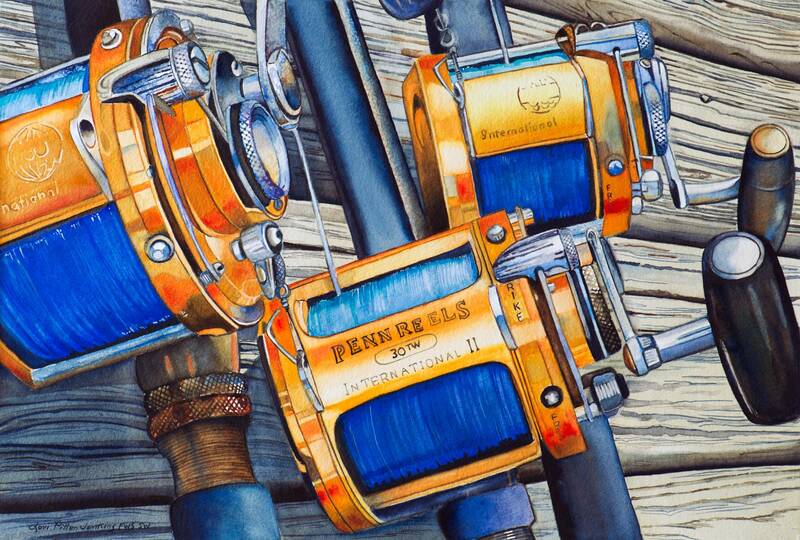 Lori is known for her whimsical, bold, bright, detailed watercolor paintings relating to fishing, seafood and boating. She has a very pleasant, unique point of view in her paintings that delight viewers.